McGregor truly owned the stage at the second stop of the promotional tour in Canada last night. 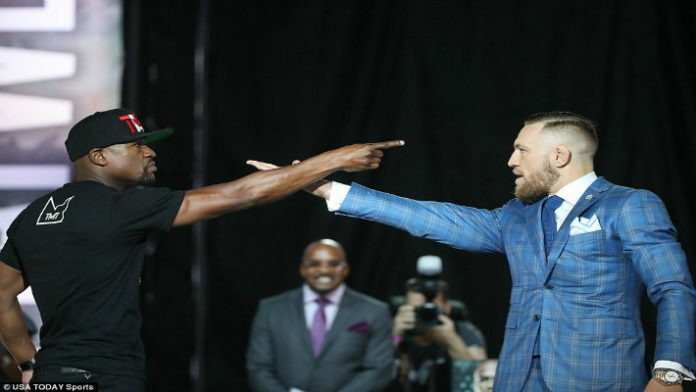 Mayweather, threatening to dampen McGregor’s parade, addressed “The Notorious” as an “eejit” (a colloquial Irish term for an idiot) before draping himself in an Irish flag much to the displeasure of the UFC lightweight champion. The 28-year-old threatened to knock Mayweather out of he did anything to the flag. ‘On the count of three I want everyone to scream at the top of your lungs: “F*** the Mayweathers,” the SBG star pupil exclaimed. “I want him to come and take this mic off me, otherwise I’m taking over this whole s***,’ he’d said. ‘It’s right here. Stop me. You won’t do s***.